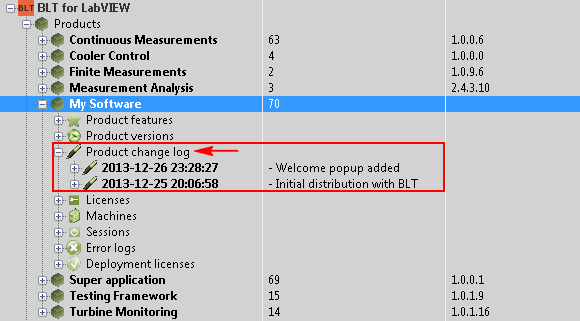 The Product Change Log is useful is you want to manage your application modifications and versions with BLT for LabVIEW. When you track your product changes and enter them in the BLT Product Change Log, you are able to follow precisely which version of your code is present at a certain time on your end-user's machines. 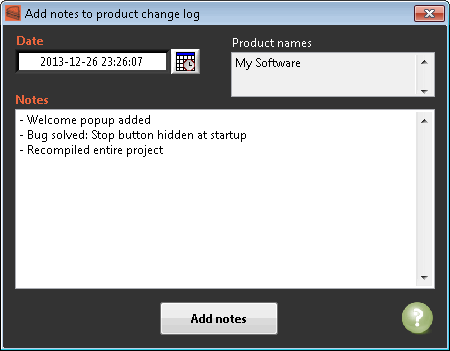 Moreover, you can automatically generate your product updates description for your end-users, based on the Change Log. •Select in the tree the product(s) for which you want to add a change description. •By default, the Date is set to now but you can change if you want. •Enter your description in the Notes field. •Click on Add notes to save the entry in the Change Log. •You can browse your product changes directly in the tree. •Select a product change in the tree and use the menu bar to edit or delete it.